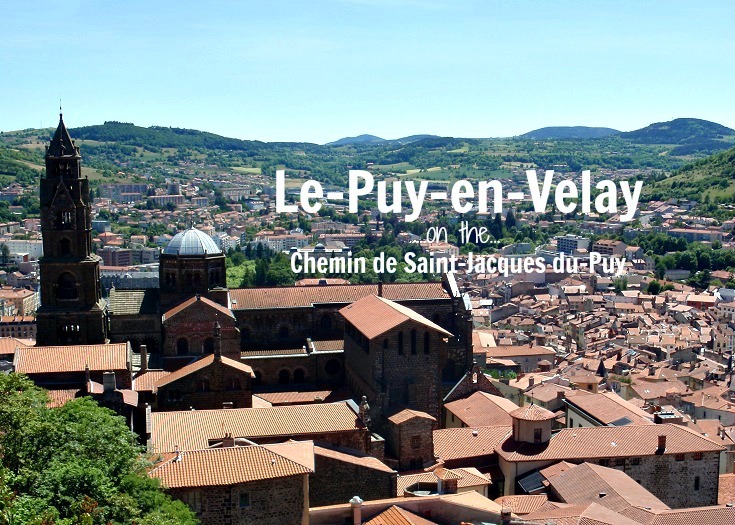 Each time I visit Le-Puy-en-Velay, I find something else about it to love and it is now one of my favourite places to visit in France. Although the town sprawls over quite a large area, the historical heart is a charming mixture of quaint alleys, colourful houses and more than enough cafés and shops to keep me entertained for an afternoon. 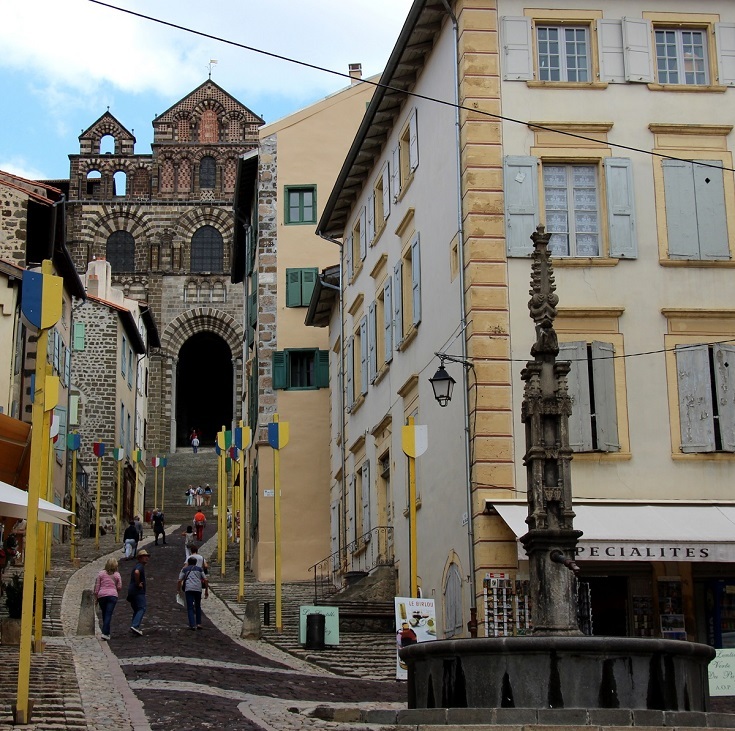 There is so much to see and do in Le-Puy-en-Velay, it is well worth allowing a full day to explore the town and visit the many monuments and museums. Said to resemble an enormous ship but only ever partially visible from the narrow streets below, the brown, black and red bricks of the cathedral give the impression of a small and welcoming parish church rather than the grand structure revealed from higher up the hill. Worshippers have been coming to this spot since the fourth century but after Bishop Gothescale made the first pilgrimage from here in 951 AD, the small church was unable to cope with the influx of pilgrims and a larger church was needed. The current building dates from the twelfth century and originally housed a statue of the Black Virgin donated by Saint-Louis. It was, unfortunately, burned during the French Revolution but later replaced by the current seventeenth century statue. As a walker, a visit to the cathedral is de rigueur as this is the starting point for the 1,522 kilometre pilgrimage to Santiago and most walkers set out only after attending the 7 am Pilgrims’ Mass (I confess I wasn’t among them!). 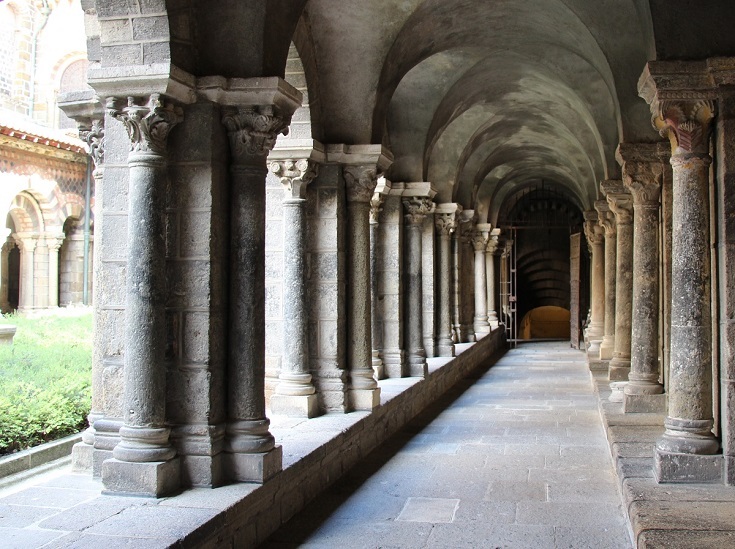 I have an unhealthy obsession with cloisters and will always suggest you visit but I do think this one is particularly beautiful. Built in the eleventh and twelfth centuries, and lovingly restored, it features red and black tiles laid out in mosaic patterns. It retains many of the original capitals and the wall of the Chapter House, where the Cannons met (and many were later buried), features a painting of the crucifixion from the early thirteenth century. Downstairs, the Treasury displays many religious artefacts—mostly a collection of gold and silver liturgical items and several beautifully embroidered garments. Among other rare and interesting objects, is a nail believed to have been used during the crucifixion and later fashioned into a horse’s bit for Emperor Constantine. It was found in an abbey near Le-Puy and has been on display here since the nineteenth century. 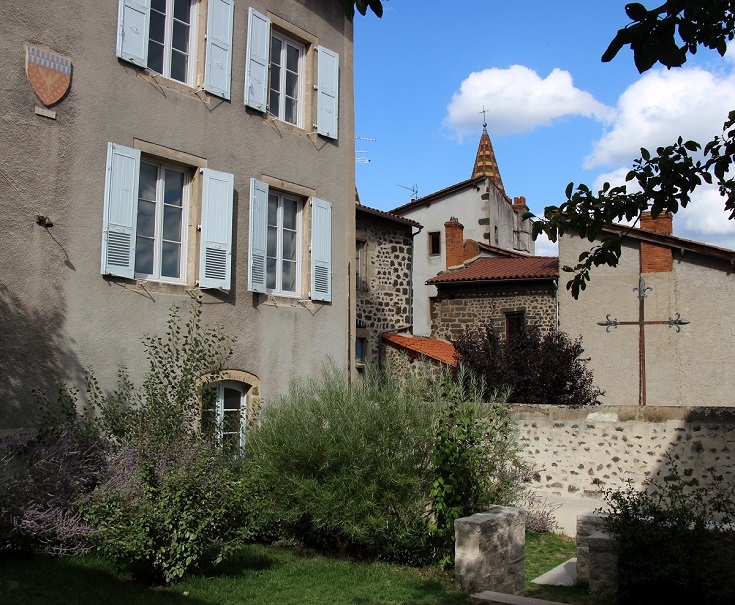 To get you in the mood for the walk along the Chemin de Saint-Jacques (or perhaps inspire you for another time), this museum (located behind the cathedral, next to the café) traces the history of the Camino from earliest times through to modern day. A short film (in French) features walkers from the 1940s, 1960s and more recently as they recount their experiences—the highs and the lows—along the Camino! Next to the museum and open to everyone (not just pilgrims! ), the Camino Café is a great place to relax, perhaps bump into some fellow walkers and ask any last minute questions you may have about the walk. 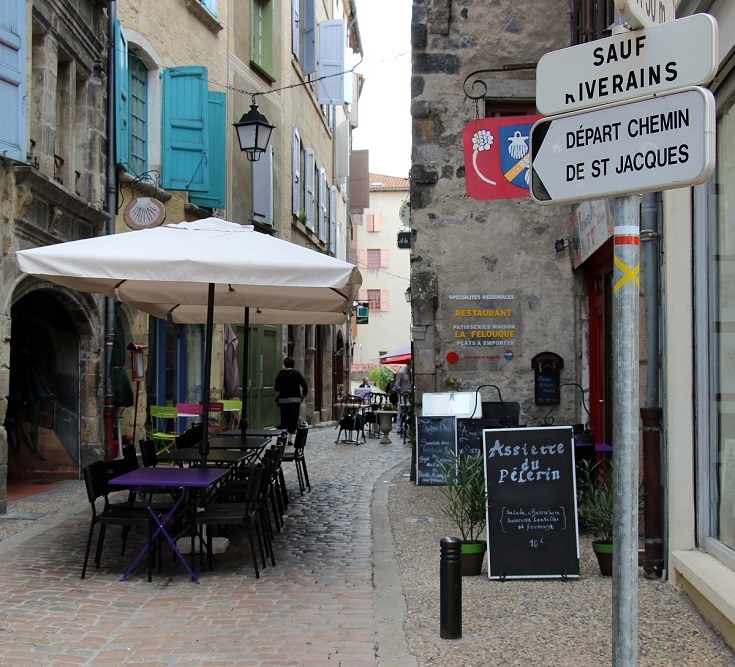 Every afternoon at 5.30, the Friends of Saint-Jacques host a gathering here where walkers setting out the next day can meet and share their hopes and plans for the following days. If you are walking alone, this can be a good opportunity to find some walking buddies while sharing a glass or two of Verveine, a herbal concoction made on the premises and a local speciality of this area. The Friends of Saint-Jacques will also make sure everyone is well-prepared and has a bed arranged for the first night. 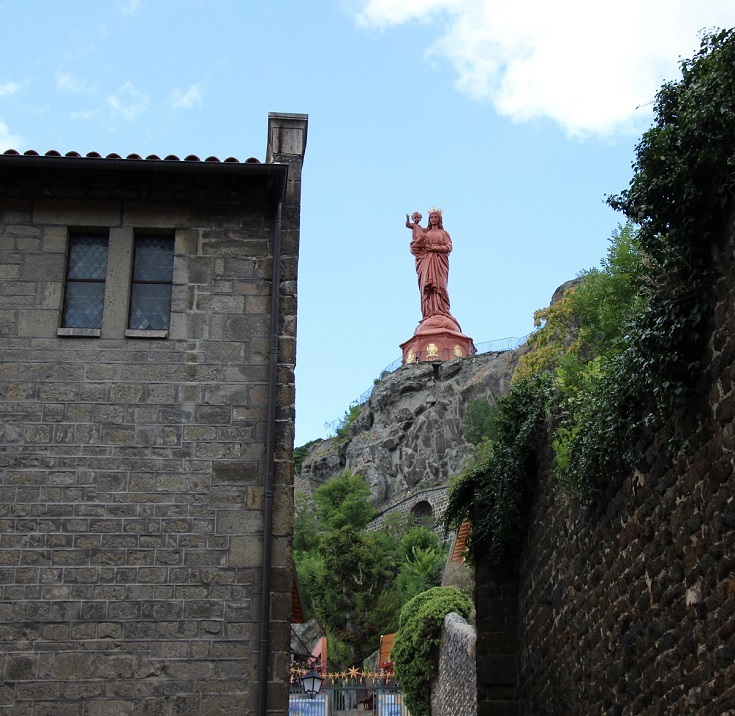 Watching over the cathedral from Rocher Corneille (rocher refers to a rocky peak en français), is an enormous statue of Mary holding the baby Jesus. Made from the metal of Russian cannons captured during the Crimean War, it stands 22.7 metres (six storeys) high and offers stunning views of the town and surrounding countryside from the base and from a viewing platform inside the statue. 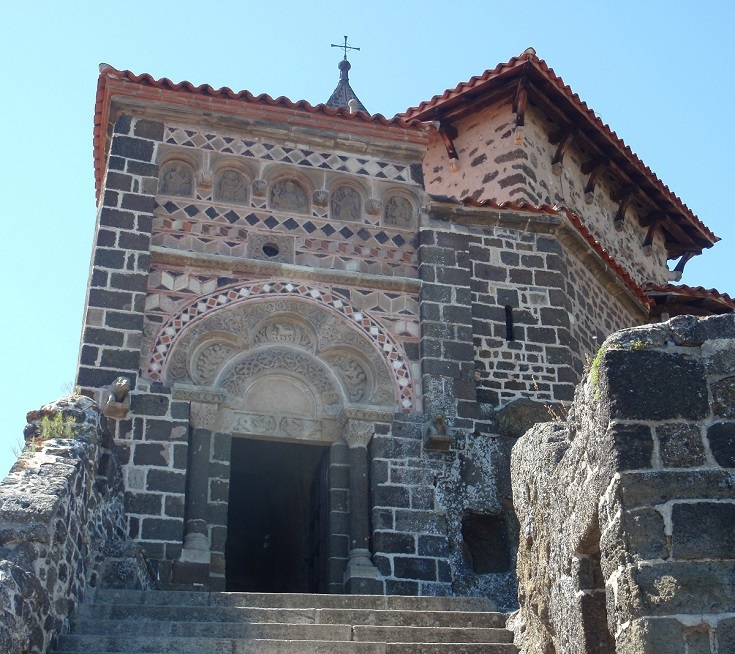 Perhaps the most stirring of the monuments in Le-Puy is the tiny Chapelle Saint-Michel, overlooking the town from the top of Rocher Saint-Michel d’Aiguilhe. A climb of 268 steps will bring you inside the chapel which was built in 961 AD and still oozes with charm and an overwhelming sense of history and serenity. 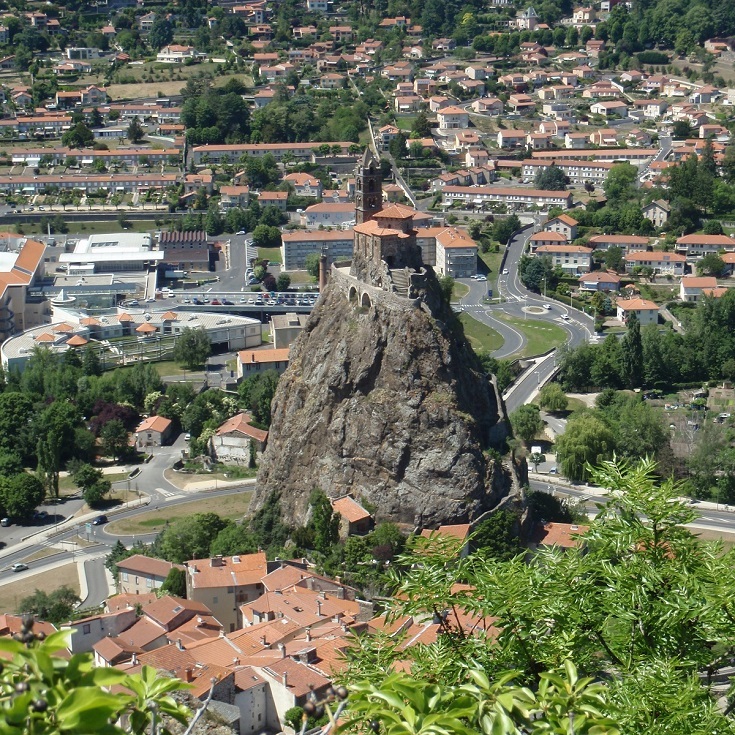 Which long-distance walk visits Le-Puy-en-Velay?